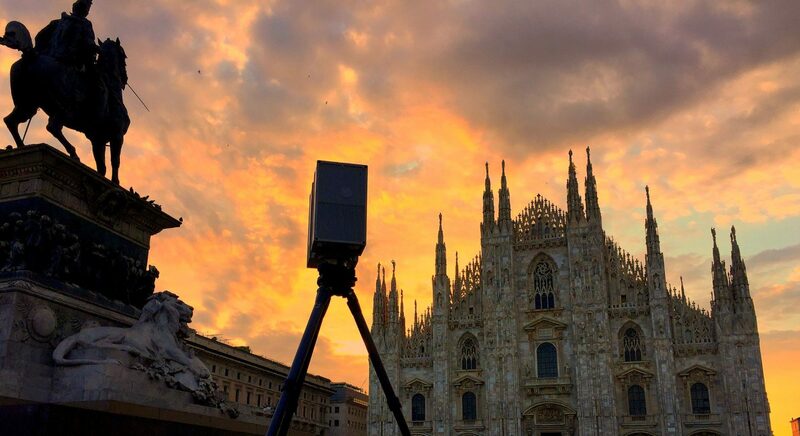 The photogrammetric survey is about a century old and can be considered the middle ground between the direct survey and the 3D laser scanner. In fact, this type of survey provides us with a series of stereo photographic images that can be measured in three dimensions. In practice, it offers the advantages of the 3D laser scanner with regard to shooting, which takes place in a very short time and allows you to stay away from the object detected, and those of the direct relief regarding the return, which can also be done at a distance of years. The images can be taken from the ground or by mounting a metric camera on a remote controlled aircraft (APR, or also called drone), reducing the distortion problems and eliminating the post-processing processes of the obtained images that do not need to be straightened. Thanks to the technological development of sensors that has led to the marketing of small sensors but ensuring high quality, mount on the APR, in addition to the metric camera (at the same time or alone), also a thermal camera to obtain information related to degradation of the material that characterizes the manufactured article in analysis. The measurable point cloud will be delivered together with a software that allows the visualization, measurement and in-depth analysis of the data produced.